I can not thank you enough for helping our family enjoy the Saturday production of "Go, Dog. Go."! The entire staff is so friendly and helpful. I especially appreciated everyone pitching in to help keep an eye on my younger son while my older one was acclimating himself to the theater in the "quiet room". Thank you for taking the time to show us around the theater and let the boys explore the stage a little. Hopefully the next time we come they will feel comfortable and we can actually make it into the theater for the show. :-) I hope that you will continue to have sensory-friendly productions in the future. I will spread the word to other families with special needs children and let them know about this great opportunity! Thanks again! With the mission of inspiring young people to creative and productive lives through the art of the theater, DCT is now proud to be able to create a positive, fun atmosphere for families with sensory friendly needs. A child with autism or some other sensory challenge who loves theater and the arts will be excited about this new program at DCT and, hopefully, with the transformational experience of theater, will be inspired to creatively contribute to the world and their community in their own way. We are so pleased to be able to offer you these specially-adapted plays for the enjoyment of those with sensory needs. Throughout the course of the year, Dallas Children's Theater will present a variety of plays from which you can choose. Some stories, especially fairy tales, may be disturbing to some children, for example, the villain or conflict in the story. If you desire more specific detail about how the story is presented, don't hesitate to call us. 12:30pm - 1:30pm Optional pre-show activities such as facepainting, clown performances, music therapy and others. Join us for a season of great stories and fun adventures! General production adaptations include leaving the house lights up a few levels higher than for a standard performance and reducing the sound level. We also offer a "Quiet Room" for children who need a break. There will be some fun and engaging activities presented before the play, so plan to come as early as one hour before the show. DCT wants to make sure families have no barriers that would prevent them from at least sampling these great opportunities created especially for them! Tickets are $5 per person. Regular DCT show prices range from $15 to $30. To purchase tickets, please call the DCT Box Office at 214-740-0051. Seating for the sensory-friendly performance will be general admission. If someone in your group needs wheelchair accessible seating, please contact us at least 24 hours in advance so that we can ensure your time here at DCT is organized and well spent. A pictorial guide with simple language explaining what can be expected when visiting the theater. Specific details about the production. A complete overview of what happens in the play. In 2014, Dallas Children's Theater was honored to be a participant in the Audience (R)Evolution Program, funded by the Doris Duke Charitable Foundation and administered by Theatre Communications Group, the national organization for the professional not-for-profit American theater. Autism Speaks provided a grant to DCT to document our pilot year of sensory-friendly performances [Download report here]. Local partners for this initiative included Autism Speaks, the Center for Autism and Developmental Disabilities at UT Southwestern, University of North Texas Department of Speech and Hearing Sciences and the Health Science Center and the Autism Center, Children's Medical Center and the Dallas Museum of Art. As a result of the first-year results, we were further honored with a three-year grant from The Crystal Charity Ball to continue this work! DCT is making an impact on families with special needs! Travel I-75 (Central) S and take the Northwest HWY Exit. Merge onto Northwest HWY East. Go approximately 1 mile. Take the Skillman North exit to the right. Go approximately 1/8 mile, turn RIGHT onto Theater Way. Travel South on the Dallas Tollway and take the Northwest HWY Exit. Travel East on Northwest HWY. Take the Skillman North exit to the right. Go approximately 1/8 mile, turn RIGHT onto Theater Way. Travel South on 35E and take the I-635 East exit. Travel East on I-635. Merge onto I-75 South towards Dallas. Exit Northwest HWY East. Go approximately 1 mile. Take the Skillman North exit to the right. Go approximately 1/8 mile, turn RIGHT onto Theater Way. Travel South on Garland Ave / TX 78 S. Continue to follow TX-78 S. Turn Slight Right onto E Northwest HWY/ TX-244 Spur West. Turn Right onto North Skillman. Go approximately 1/8 mile, turn RIGHT onto Theater Way. Travel I-75 (Central) N and take the Northwest HWY Exit. Merge onto Northwest HWY East. Go approximately 1 mile. Take the Skillman North exit to the right. Go approximately 1/8 mile, turn RIGHT onto Theater Way. Travel I-30 West (R.L. Thorton) and take the I-75 North exit. From I-75 N take the Northwest Hwy Exit. Merge onto Northwest HWY East. Go approximately 1 mile. Take the Skillman North Exit to the right. Go approximately 1/8 mile, turn RIGHT onto Theater Way. Travel I-30 East and take the I-75 North exit. Continue down I-75 N and take the Northwest Hwy Exit. Merge onto Northwest HWY East. Go approximately 1 mile. Take the Skillman North Exit to the RIGHT. Go approximately 1/8 mile, turn RIGHT onto Theater Way. 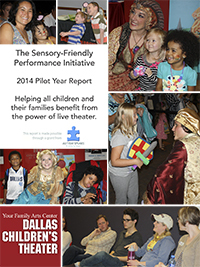 Interested in learning about how we brought sensory-friendly performances to Dallas?